I read this article and found it very interesting, thought it might be something for you. 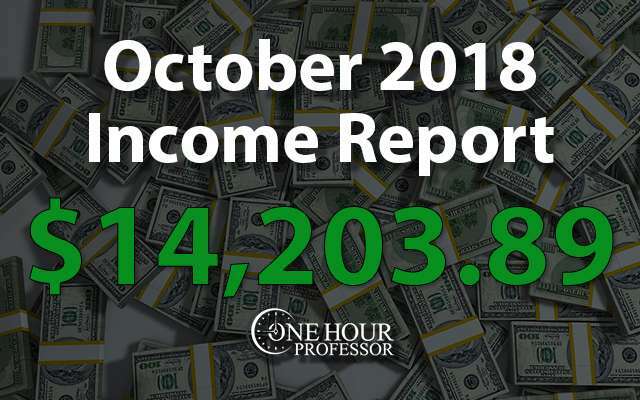 The article is called October 2018 Monthly Income Report and is located at http://www.onehourprofessor.com/october-2018-monthly-income-report/. October was another solid month as I hit my third highest amount ever in revenue. The profit was only slightly more than last month, but that’s mainly because I had additional costs as I paid to have more calendars made for one of my niche websites. This month my total income after expenses was $14,203.89 which comes out to $458.19 per day. I saw an increase in traffic to JFFH by about 13%. While that usually wouldn’t be something to get too excited about, the fact that I have over 300k pageviews each month makes that a big number. Pageviews for the CK website increased by roughly 32% and that’s a very big win considering how hard it’s been to get this website traction. To be honest with you, it’s been a grueling month in terms of personal affairs to deal with along with my online business. That said, it hasn’t necessarily been bad. First off, my wife and I are at the end of the road to get her the green card that we’ve been waiting for. While I won’t get into the difficulty of getting approved for temporary citizenship in the USA, just know that if you ever have to deal with it, it’ll take at least a year to figure it out. In the last month, I’ve probably spent 10-20 hours filling out forms and scanning/mailing things into the system that handles this. Now we’re waiting for one more sheet from the Brazilian government and she has an interview to complete, but once that is done, we should be all set. Secondly, and something we’re incredibly excited about, we’ve officially bought a house! I made mention of this a few months back saying how we were shopping and considering buying something. Well, that time is now and this month I’ve had to deal with all of the paperwork that needed to be collected in order to make that purchase. This also took about 10-20 hours and although there have been endless headaches, our closing is on 11/30 and once that’s done, we’ll finally have a place to make home base for many years to come. I’m sure many of you will want to see pics of the house, so here it is. There are a few things about this house that we absolutely love. You can’t tell from the pictures, but across the street from the house is a very large park so it helps us feel like we’re in the middle of nowhere, even though Walmart and Target are roughly 3 minutes away. (My wife is VERY excited about that, by the way). It has an unfinished basement which, for me, is amazing. I am planning a home gym, man cave, an additional bedroom, and full bath. 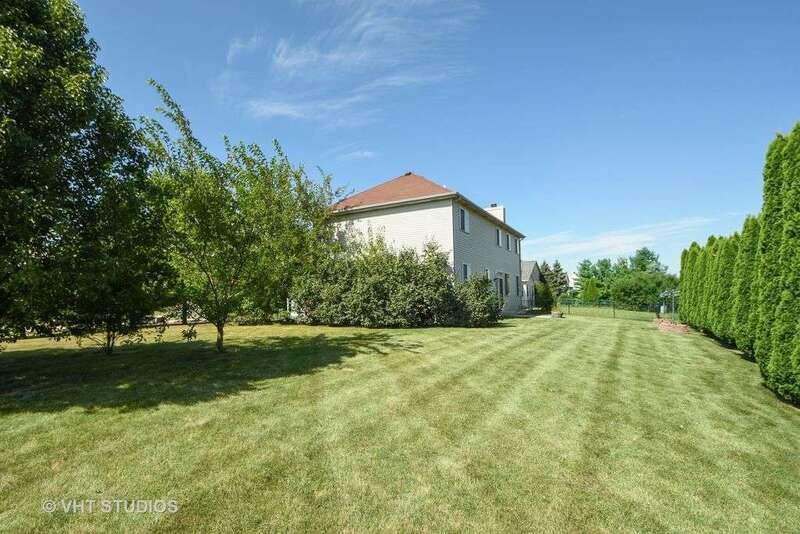 As you can see from the second picture, the yard is pretty huge. It’s a corner lot and there is so much we can do in the future. ​To think that WEBSITES are how we are paying for this puppy is a pretty amazing concept. 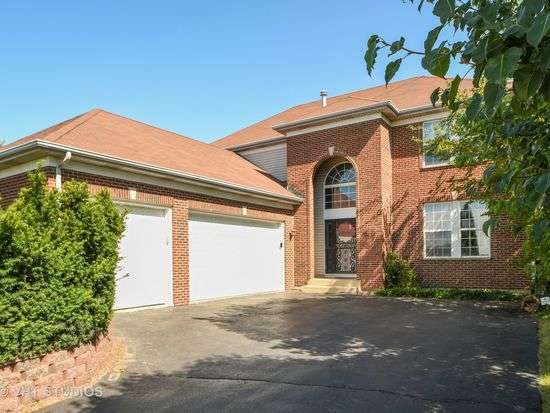 Not only that, but the fact that I could sell a website to pay for this house in full is nothing short of amazing. ​That all said, if you're looking to create a website that could (maybe) help you buy a house in the future, I suggest you read this story all the way through and put in your email for the free mini course at the end. JFFH Website: There was a big jump this month in traffic and earnings for this website and I’ve also noticed that I am ranking#1 for all of my main target keywords. It’s interesting mostly because I haven’t done any additional link building or anything. I feel like at this point, the website is so old and has so much authority that Google feels anything we write should hit page 1 within 24 hours. I wish Google felt this way about all my other websites, but that isn’t the case at this moment unfortunately. JFTHQ Website: It’s unfortunate to see, but for the fourth month in a row, I’ve seen a traffic drop to this website. Of course, earnings have a direct correlation to that and they’ve dropped as well. I’m doing quite a bit of link building at the moment and I also have a huge project underway to make some of the resources on the website much better. My hope is that with the additional link building and the revisions to some of the main functions of the website, we can push it to a better place on Google’s search results. 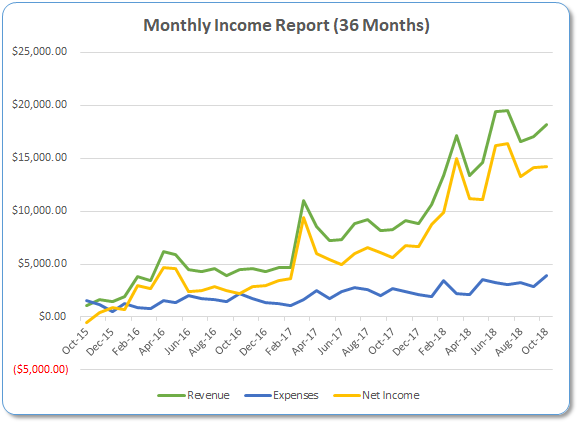 BCC Website: I mentioned last month how I saw a pretty significant decline in earnings to this website and luckily, I was able to figure out why that was and how to remedy it. The thing with this website is that we have a HUGE Facebook group that continues to grow by 50-100 people every single day. What I’ve been doing is posting various articles and content into that group with Amazon affiliate links. The ultimate goal here is to drop the Amazon cookie into the browsers of users so that if they buy anything in the next 24 hours, we get out commission. I discovered near the end of the month that the tool I use to post to the group wasn’t working at all, and actually hadn’t been working for 3 weeks prior. After I noticed, we fixed the issue and put the articles back in the Facebook group. There was an almost immediate bump that started to increase commissions, so I think this will help us in the months to come. Calendar Printing Services: There was a very large printing cost that I only incur once a year, and that’s when I make the calendar. At about $750, this was a cost that was significant. Labor Costs: My writing/editing and research/labor costs are also higher than usual and that’s because when I make more, I invest more. Probably 80-90% of this is to create additional content to my various web properties. Full Portfolio Update: ​There wasn’t any crazy trends I saw this month that were surprising. I think the only thing I did across all of my websites is implement ManageWP.com. I did this for one simple reason, redundancy. You see, ManageWP.com is a place where you can manage all of your WordPress websites from one dashboard. Plugin updates, theme updates, anything to manage your websites can happen in one interface. Beyond that though, and more importantly, this platform is now backing up my websites every single day. My host already does this, so you may be wondering why I choose to get this service. Simply put, it’s tough to trust ONE platform to manage your entire website portfolio safely. All it takes is one fire in a warehouse somewhere or an earthquake and then BAM, your entire server is gone and your business as well. Most hosting providers have plans in place so that if this ever happens they can recover your website(s) and that’s great, but I feel much safer having a second provider backing them up….just in case. After all, if these servers got fried and the websites would be completely lost overnight which means everything I’ve worked for the last four years would be destroyed. Plus, and something that’s very important, each website costs $1 per month so it’s hard not to be willing to “splurge” for that peace of mind. One other thing which isn't technically part of my website, but is my wife's new website. She's working on a new project in the fashion/beauty industry over at HelloThalita.com. While it isn't my business, I'll definitely be guiding her in her strategy and (hopeful) success! JFFH Update: There was a great 13% increase in traffic for the month of October and my earnings increased with it. For this website, things continue to steadily increase and it’s still my main income source. I’m really hoping that one day another website will overtake it’s earnings, but that wasn’t the case in October so I guess I’ll just have to wait. Consulting Update: I had one consulting call this month and admittedly, thoroughly enjoyed it. It’s honestly less about the money at this point and more about talking to people who need the personal help. I love diving into people’s minds that are trying to make it online and discovering what they’ve tried and the issues they’re having. It’s a lot of fun for me and let’s me reflect on what I’ve been able to do and how hard it actually is. Udemy Update: There was a solid increase in earnings here and while I have no idea why, I was happy to see it. OHP Website Update: For now, no news here. My potential partner is still dealing with personal issues and also took on a new job, so I don’t know that the podcast will ever happen. If that’s the truth, I REALLY need to figure out what I can do with this website. JFTHQ Website Update: I am a little frustrated by this website, but what else is new? I started this one in November of 2016 so we’re almost two years in and although things aren’t ideal, I shouldn’t be too upset considering how much money it’s making each month. It can do better and be bigger than JFFH and I know this. The market is at least double the size and with the right exposure on Google, this one will be an absolute beast for earnings. As of now I am trying to fix this with three methods. I’m revising a main component of the website to make it more useful. I can’t give away all details here as it would expose the type of website it is, but this is a crucial part of the website that needs to get improved and is a function that almost all website visitors use. Backlinking continues. I have consultants helping find link targets and consistently message 30-50 contacts a day seeking backlinks. While my current backlinks are okay, they need to grow and that’s what I’m working towards. New content. Beyond these strategies, I’m also having a writer post two pieces of content each week. The problem with this content is that it’s very competitive and already has quality results, but I’m hoping we can out-write the competition and get ranked beyond them. Earnings fell by about $700 for the month and while that stinks, I’m surprisingly okay with it. This is because I still haven’t lost faith in this website and strongly believe it can still rebound from this and be even bigger than before. Referring domains fell by 12 for the month and I’m thinking this is more because the tool reporting the information isn’t correct. While I can’t say for certain, it seems strange that the backlinks dropped by 12 in a single month considering I’m still link building as well. One of the main issues with this website is that some of the functionality is lacking. This is the exact functionality that I’m having my developer work on this month and I hope once it’s fixed, I’ll stop getting complaints about the issue. This same issue is also the main reason why people don’t backlink to me as they feel like I don’t have a good enough option for their situation. This update will (hopefully) fix it. 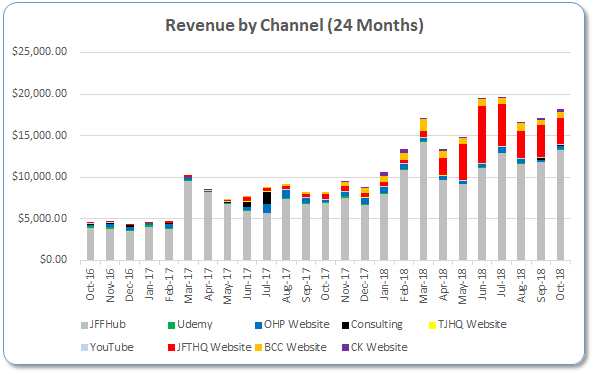 BCC Website Update: Another decent month in October and I already mentioned how I was able to fix the affiliate income issue I was having related to Facebook postings not being published in the website’s Facebook group. Now that I’ve fixed it, it looks like my income is steadily rising now and I’m obviously happy about that. I’ve also noticed that my traffic is almost the exact same every single month for the last three months which is a pretty awesome considering I haven’t published anything in a year. At some point it’s going to make sense for me to review this website for additional ways to optimize for income, but I don’t think that’ll be happening before the end of the year. Referring domains had a decent jump and I did absolutely nothing to make that happen. This is now growing with backlinks organically and if it keeps going, this website will be a safe income platform for years to come. CK Website Update: This was a great month for CK and not only did the pageviews increase, but so did the revenue and referring domains. I’m pretty psyched up about the fact that the referring domains only jumped by 7 backlinks because I know for a fact I had at least 25 more backlinks added to the website. I think at this point that Google just hasn’t seen all of the backlinks yet and as time goes on, Google will begin to realize how many links are actually pointing to the website and reward me accordingly. It’ll take some time, but it’s encouraging and I still have really high hopes for this website. Beyond these positive signs I was also able to get a few review-type posts ranked recently. The rankings weren’t very high and they went from a position over 100 to positions 43 and 62. Or, in layman’s terms, pages 4 and 6 of Google search. While this is only moderately encouraging, it’s something to get excited about. Time will grow this website and I will make a killing with it once it grows to the point that I think it can. It’s not easy and it’s taking a ton of time, but I really think I’ll do incredibly well with this one because it’s most than Adsense and affiliate. As I’ve said before, this one will end up making a full brand and I will sell my own products on Amazon, which I think will be incredibly lucrative. Documentation is Key: When I was training my editor, I documented all of my work and direction so that when a new editor came on, I could seamlessly plug them in. Well, that day happened as my current editor decided to leave and I had to find a new one. While it was a bit of a headache, the new editor seems like a solid worker and hopefully she’ll grow with the brands. Though I didn’t like seeing her leave, all of the documentation I did in the past paid off on this one. Training was minimal and though I still have some training to do with her, it’s overall going very well thus far. Life Gets in the Way: This month was brutal as I had an abundance of work to do and even more distractions. Sometimes this happens and the only way to get through it is to keep working. That happened this month and though I had crazy distractions, I’d say things went pretty well all things considered. Passive Income is Amazing: Okay, I didn’t just learn this, but I think it’s a nice reminder. There were plenty of days this month where I didn’t check my earnings at all and then a few days later I saw I was making $500+ dollars per day. If my income wasn’t passive, this wouldn’t be possible and I’d be a pretty broke guy at the moment. I did this on October 31st and though the house purchase and immigration paperwork really slowed me down, I did get it done. It feels good to be completed with it and we’ll see how it does on Amazon. I started the research for this new database and we’re pretty far into it thus far. My VA will still have to build all of the pages and build out the content on them, but this database continues to evolve and I think by the end of the year she’ll start actually building out the pages. I meant to learn Pinterest this month and I did 0% of that. I do intend on doing it still, but things came up that stopped me, so we’ll have to push this into November. What Are My Goals for November? I plan on getting the new 2019 calendar up for sale on Amazon in November. The cool thing about this is that if you search the calendar type in Google, I have a blog post that relays them to my own product. Now I’ll just need to swap that link of the 2018 calendar with the 2019 one and we’ll see how well it does along with Amazon’s organic ranking once I send sales to the listing. It sounds like a weird goal, but this month I want to take a step back and THINK about my businesses. I’ve noticed that since I’ve been working so hard the last few months, I have been focused on working in my businesses, and not actually on them. I need to take time to reflect on what I’m doing and analyzing to find room for improvement. I completely missed the boat on this one, but my wife will be leaving on the 8th this month and my house will close on the 30th, so I think I’ll have time to dive in. Congrats on the house Ron! Keep up the great work as always! Thanks Brennan! We’re really pumped up about it. A lot of work and renovation will bee needed, but it’s perfect! Love reading your income report every other month. Glad you liked it, Blake! Stay tuned, more to come.